We absolutely love fresh homemade juice made in our juicer! 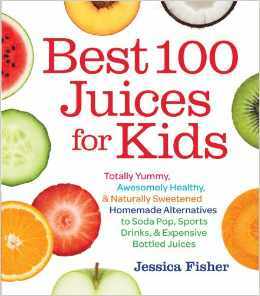 If you are a fellow-juicer or would love to increase the consumption of healthy, yummy, naturally sweetened juice instead of sodas, sports drinks, and expensive juices, then you need to check out my friend Jessica’s new book, Best 100 Juices for Kids: Totally Yummy, Awesomely Healthy, & Naturally Sweetened Homemade Alternatives to Soda Pop, Sports Drinks, and Expensive Bottled Juices! You don’t have to own a juicer to benefit from this book as about 25% of the recipes can be made without a juicer. However, to truly get the most out of it, you will want to have a juicer of some sort. I personally own the Hamilton Beach Big Mouth Pro Juice Extractor and love it! Currently, Best 100 Juices for Kids is 34% off on Amazon right now priced at only $11.14 with free shipping through Prime or on any $35+ order. Buy it today and get ready for delicious refreshment just in time for the heat of summer!